A fair question to ask for any prospective pet owner, since many new pet owners worry about the prospect of loose hairs all over their house. Consequently when I wanted to get a new pet I wanted to know the frequency of hair or fur shedding that my puppy may have. Most animals with hair or fur, shed seasonally. Of course that includes all breeds of dogs and by the way humans too !! Surprising as it may sound humans also lose hair from our heads from time to time. When I use the word shed or shedding I mean the dropping of the loose hairs from their body. Usually this kind of fur shedding is a seasonal event and this holds true also for dogs including french bulldogs. I also learned that seasonal shedding can usually range from excessive shedding to less shedding with in between moderate shedding being the most common usually depending on the dog breed. Most french bulldogs naturally shed less hair than other dogs as they have a single coat ( a top coat ) rather than two coats ( top coat and undercoat ) like other breeds of dogs. So your french bulldog by its very constitution does not shed out its undercoat and then grow a new one seasonally hence there is less shedding. This however, is also the reason most french bull dogs feel cold easily and need to be kept warm. Some of my pups are coming from the parents with the double coat, some have just a single coat. The coat texture changes as the puppy matures. Another reason for less fur shedding in frenchies is that french bulldogs have very short hairs on their top coat. Having said that it’s important also for me to point out that there are always exceptions to the rule, that is to say there are frenchies with medium fur as well as frenchies with long furry hair also. 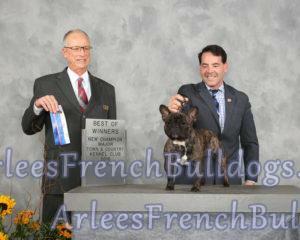 Most french bull dog pet owners however report moderate shedding to low seasonal shedding. Some also include brushing with the FURminator to reduce shedding but many also say it does not work well with top coats but is great with under coats. So since french bulldogs have just one coat and no undercoat I am not going to include the FURminator in the list of factors that help reduce shedding. Also, the rubber brush helps as well. I have used both. However, sometimes, Fulminator cases skin irritation when used frequently and just really with no reason. However, it is very overactive tool. I have a boy, who has a really heavy coat and also an undercoat. I have used the tool on him right before the show. I achieved the results but skin was red and very irritated. So, I use it now but very carefully, and I prefer the rubber brush. It takes longer, but it does not irritate the skin. Food I do believe is one of the most important factor’s that contribute to seasonal fur shedding. A healthy balanced diet with the right minimum processed foods which contain a mix of good food digestive enzymes and probiotics ensures a healthy shiny and soft top coat for your french bull dog with less shedding. Raw food works very well, it makes the coat soft and shiny , also healthy looking. While many use the FURminator amongst other ways to reduce loose fur and hairs in their pet french bull dog’s coat I still believe in simple old fashioned brushing. A simple good soft (but not too soft) brushing on a regular basis does wonders not just for the french bull dog’s fur coat but also reduces shedding. Consequently the amount of loose hairs you find in your carpet while vacuuming or on the sofa or bed are much much lesser. Keeping your french bull dog’s coat clean with a bath maybe once in every two or three weeks maybe even once a month ( if that works for you ) helps reduce shedding. Other weeks of the month perhaps once a week or maybe once in two weeks, you could just use a dry shampoo ( waterless shampoo ) to clean and deodorize their fur. The dry shampoo is not really the best way to keep your dog clean, but it works. The good old fashioned bath with the oatmeal shampoo is the way to go. Speaking to your vet about fish oil supplements which include omega 3 and omega 6 fatty acids in the right optimum combination and other important minerals and vitamins that your french bull dog puppy may need is also a great way to ensure good health and less hair shedding. Allergies may also cause excessive shedding. So your vet could also be a good source of a list of doggy vitamins to keep allergies away. Depending on the advice given by your veterinarian supplements and the fish oil can be added to the french bull dog pup’s food or can be given with the treats kept for them. These must be regularly given to your french bull dog from puppyhood well into mature adulthood to show best results. Of course if your french bulldog is prone to allergies then chances are fur shedding may also be considerably increased. However unusual or sudden shedding is always a warning sign and may require a visit to the veterinarian. There are several serious illnesses which have fur shedding as a symptom so it’s best to definitely check this one with your veterinarian. The shedding factor may also depend on the genetics of the french bulldogs bloodlines. So when you are actually researching the specifics of a french bull dog puppy to purchase it is a good idea to ask the breeder from whom you intend to get your french bull dog puppy whether the sire and /or dam, grandparents or great grandparents were prone to excessive shedding ? Sometimes this trait may even miss a generation or two generations. Also certain types of rarer french bull dogs may be more prone to shedding. So in case you do opt for a rare colored french bull dog so discuss the possibilities of excessive shedding with the breeder. Shedding excessively or patchily should be a known consequence of a recessive underlying medical condition. In any case the breeder would know this best so it’s better to check with the breeder about the family history of your french bulldog puppy. As I understood once I was a pet owner the critical question to ask myself was does my french bulldog’s fur shed naturally or is it because of an underlying medical condition? An indicator of this was any sudden change in the usual pattern or quantity of fur being shed or if there is any patchy shedding. Patchy shedding happens sometimes even with the healthy dog. But, generally, it is very unusual for it to happen when the dog is healthy. If it happens, you need to look closely at the skin color, if the skin is red, or itchy. If those symptoms happen, it is better to check with your vet, to make sure that you rule out serious skin conditions.